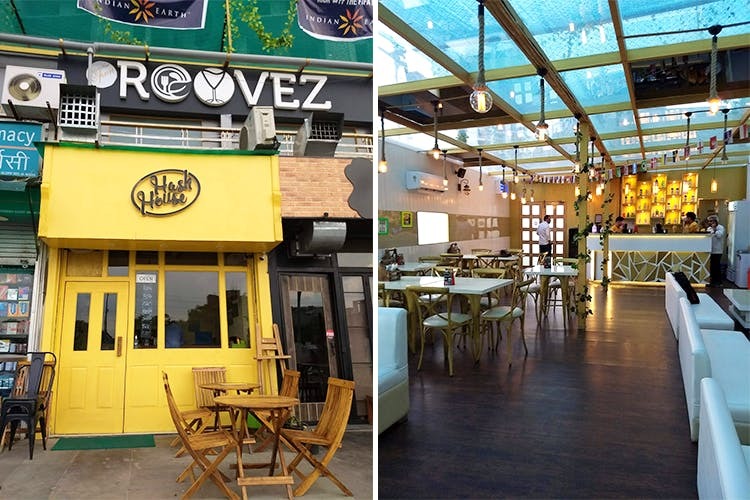 Roovez in Sector 45, Noida, is a big, bright and brilliant cafe-meets-bar. It’s one of those neighbourhood watering holes, only it’s spacious, and comes with a pretty glass roof that lets a lot of sunshine in through the day and turns to a mirror (with trippy light reflections) at night. Cocktails, parties, casual catch-up scenes, cafe food, chill vibe. The space is run by a team of two: One person runs BurnOut food truck in Noida and the other one has experience in hospitality management from his stint in Australia. While Roovez opened its doors only a couple of weeks ago, it’s already getting a whole lot of love from the locals. When we say locals, we mean papa-mummy-baby type families to those working in glass-window offices on the Expressway, and even Amity students on a day they’ve got a little more money to spend (or a date). We love that this non-shady (yes, you’ve got our word on this) bar becomes a different person as day turns to night. The men behind the bar know how to whip some yummy cocktails up too. Our whiskey-hating selves found their American Pie that combined Bourbon with apple and cinnamon, rather nice. The Green Apple Rooveztini was memorable too. Other stars from the evening: Cottage cheese bruschetta and Melange Of Mushroom. End your evening here with an apple crumble. They were planning on undergoing some renovation to have their own washrooms but hey, the time we went, we had to step out and use the common one in the building. This, dear friends, wasn’t the most pleasant experience, so consume those beers with extreme caution. They have a separate area with all-white floor seating. It’s got dreamcatchers and chandeliers and separate speakers that can be lowered to allow for booze-filled conversations to flow. This section is ideal if you’re throwing a party of 10–20 folks who could do with some privacy (and pina coladas, obviously).Follow their Facebook page for deals on shots, beer buckets and cheap alcohol.